Setup: Pour a full beer in a bowl, and lean an ice tray on the edge of the bowl. Each person also needs their own beer. Gameplay: Each person bounces a quarter towards the bowl. 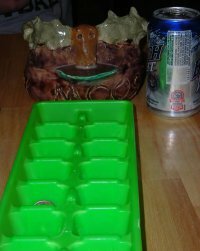 If they make it in the right side of the ice tray, they must take as many drinks as notches up the ice tray the quarter came to rest. If they make it on the left side, they pick someone to do this. If they make it in the bowl, the last person to lift their hands to their head in an attempt to make "antlers" must drink the bowl, but they get to make a rule. There is no end to this game, play for as long as you want, but it can get very complicated with more and more rules.